Ron Gillette was an early collaborator with Marc Smithwell before the slam began and the word "slam" was even coined. Thus his presence with Marc Smith had an important influence on how Smithwould employ performance for poetic ends. He lived in Milwaukee by March 1988 established his own venue there which ransuccessfully for two years. Chicago's performance poetry initiative had afew years lead-time over Gillette's hometown. Also, he"imported" Chicago artists in an effort to demonstrate theslam style and cultivate interest in slam poetry in Milwaukee. He claimed the Milwaukee poets felt a bit daunted when they compared themselvesto their Chicago contemporaries.Reception to slamming in Milwaukee was therefore a bit coolerthan in Chicago. This did not prevent Milwaukee fromeventually assembling a team of its own to compete in theNational Slams, but they did not attend until 1992. By thattime, Gillette had retreated somewhat from the Milwaukeescene and had even begun commuting back to Chicago for work. On these trips,he stayed with Marc Smith in Wicker Park. Gillette's own first experiments with character and voice influencedSmith's sense of theatricality. 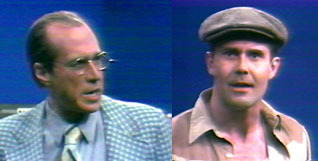 Performing as a duo, Smith took more of a straight man'srole and exercised a somewhat more dense poetic language, while Gillette ( pictured in costume with Smith, from Evanston Cable's "The Friday Club", circa 1986 ) felt free to don clothes and make-up just fora particular piece. While Smith created characters more from his own personna,Gillette would morph into whatever best suited his text. Co-conspiringwith Jean Howard, the trio would build suites of theatrically-driven performancepoems and eventually induct other poets into their larger projects so that by 1986 theirbiggest venture, the Uptown Poetry Slam, was born.